Award-winning artist and writer Shaun Chi Yeong Tan was born in Fremantle, Western Australia. He began drawing dinosaurs and space ships as a child, and is largely self-taught as an artist, apart from an art program attended in secondary school. His SF illustrations first appeared in Australian magazine Aurealis in 1990, and in 1992 he won the L. Ron Hubbard Illustrators of the Future Contest – making him the first Australian to win that prize. Tan earned a BA with joint honors in Fine Arts and English from the University of Western Australia in 1995. From 1994-96 he did political cartooning for various newspapers, and began illustrating YA horror series After Dark in 1996. He wrote the 28th novel in the series, The Playground (1999), which was shortlisted for the Western Australia Premier’s Book Awards and made the Children’s Book Council of Australia’s list of Notable Books. 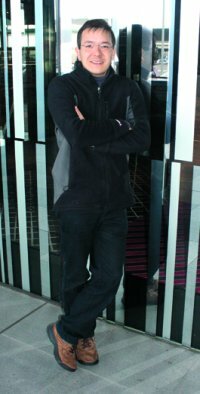 He collaborated with Gary Crew on The Viewer (1997), winner of the CBC’s Crichton Award, and Memorial (1999), which won an Australian Publisher’s Association Design Award. The Rabbits (1998, with text by John Marsden) was named Picture Book of the Year by the CBC in 1999; the cover won the Spectrum Gold Award that same year. 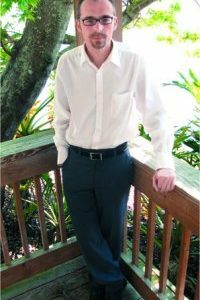 Shaun both wrote and illustrated The Lost Thing (2000), which won a Spectrum Silver Award for book illustration. Both books won Aurealis and Ditmar Awards for Australian SF and Fantasy. The Red Tree appeared in 2001. Tan’s wordless graphic novel The Arrival (2007) was named Book of the Year at the New South Wales Premier’s Literary Awards, and won Picture Book of the Year from the CBC. It was also a finalist for the best related book Hugo Award. 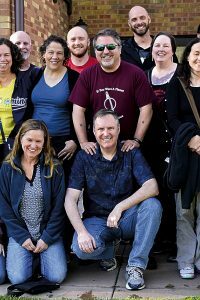 His illustrated story collection, Tales from Outer Suburbia (2008), won both Aurealis and Ditmar Awards for art, and was a finalist for best collection in the World Fantasy Awards. The Lost Thing was adapted as a 15-minute short film in 2010, co-directed by Tan, and won an Oscar in the Best Animated Short Film category at the 83rd Academy Awards in February 2011. Tan won World Fantasy Awards for best artist in 2001, 2007, and 2009; a Hugo Award for best professional artist in 2009; and was guest of honor at the 2010 Worldcon in Melbourne, Australia. Tan lives in Melbourne, Victoria, Australia. “The first thing you learn when you start drawing is to stop looking at objects as concepts or ideas, and studying them in a very empirical way instead, as, for instance, circles and ovals and intersecting joints. It’s actually a slightly autistic way of looking at the world, and allows you to reassess things, to some extent, to check your understanding. An equivalent experience is traveling overseas, the most ordinary objects suddenly become unique and fascinating. You are reminded of what it’s like to be a child, seeing cups, roof tiles, fish, or shoes for the first time. ‘‘The Lost Thing became an animated short film. How that happened is a long story. The book was exhibited at the International Children’s Book Fair in Italy, where it was spotted by Andrew Ruhemann, a producer with the animation studio Passion Pictures – quite a large London-based studio that deals mostly with TV commercials, documentaries, music videos (such as ‘Gorillaz’), and some feature film. Andrew was looking for a short animation project: something which could be useful as a flagship for the company, and a bit of research and development for their animators. You don’t make money out of short films, but it’s a good way of showcasing people’s work, perhaps leading to a bigger projects. ‘‘There followed a series of discussions, asking if I would be interested in granting them an option, and secondly if I would be interested in being involved creatively. When I saw the caliber of their work, I was really impressed, and I agreed to both. ‘‘Andrew came to Melbourne and met up with Sophie Byrne, the producer who eventually took over the project. I came over from Perth, and we all met for two weeks, storyboarding and just talking conceptually. That was early 2002. Next came a protracted period of storyboard revision, researching different commercial lengths (anything from 11 minutes to 24), and talking about things like, ‘Could we change the story, make it more dramatic?’ In the original story very simple things happen, and it’s actually about apathy, which is kind of a difficult thing to dramatize! That was a constant creative problem, and the extent to which you could get away with an apathetic main character was the subject of some debate between myself and Andrew. ‘‘Mostly, I was designing everything and storyboarding, in discussion with Sophie and Andrew. I knew nothing about film at that stage, so they were really instrumental in guiding me through the process. And then those drawings would go to our modelist, Tom Bryant, who started making digital models of landscapes and characters. This kind of animation is very layered and sculptural, closer to puppetry than painting, so everything in the film kind of exists as ‘real’ objects in a virtual space: you can move the camera around them, and light them differently, adjust their animation. Stop-motion would have looked great, but was prohibitively expensive. We ended up with a good digital equivalent, I think, by using hand-painted textures wrapped around carefully designed elements. It’s worth noting too that all the visuals in the film were the creation of three guys: Tom doing modeling, texture and lighting; Leo Baker our solitary animator, rigger and editor; and myself as the ‘art department.’ Most short animated films involve at least ten times as many people. Read the complete interview, and biographical profile, in the April 2011 issue of Locus Magazine.